The Assembly of First Nations National Chief Perry Bellegarde called today's roundtable meeting on missing and murdered aboriginal women in Ottawa a start but he will continue to push for a national inquiry into the issue. Issues regarding policing and justice. "This is a step. We're still moving towards the call for a federal inquiry. That is there. 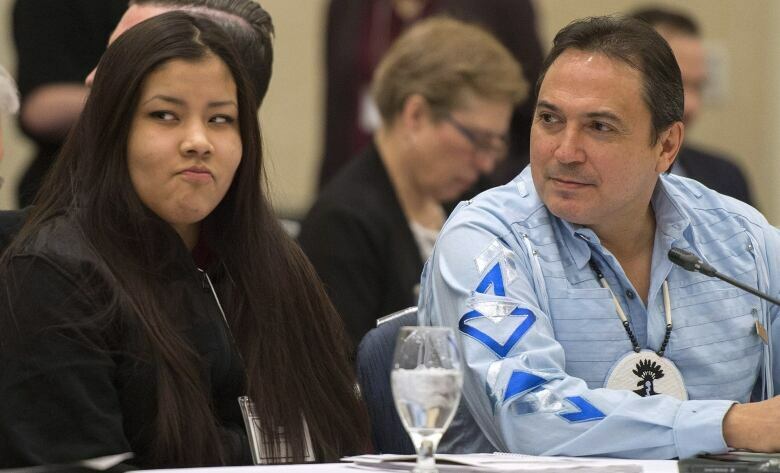 That will not go away," said Bellegarde. National prevention campaign and awareness program. Best practices task force on policing and justice. Participants also agreed to hold another roundtable meeting before the end of 2016. Minister of Aboriginal Affairs Bernard Valcourt and Minister on the Status of Women Kellie Leitch held a separate news conference in a different location from the Provincial, Territorial and aboriginal leaders. "Out of respect to the 20 organizations as well as to the families, we felt that they should be able to get their message out," explained Leitch. 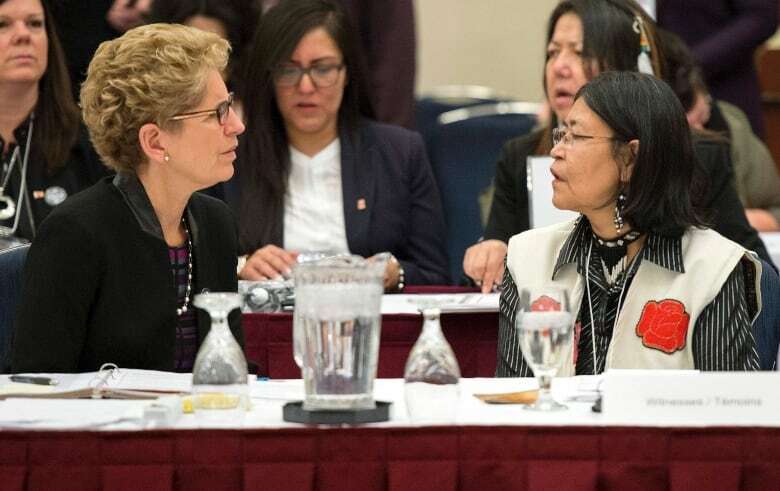 She also pointed to the fact that her government has already taken action in the form of a plan to address violence against aboriginal women and girls. The government has budgeted $25 million over five years to deliver the plan – a commitment first announced in the February 2014 budget. Earlier Friday, Susan Truppe, the parliamentary secretary to the federal status of women minister, insisted in the House of Commons that the government has taken action to alleviate the problem and that no more studies are needed. Liberal M-P Carolyn Bennett, attending a similar meeting in Calgary, says many people and groups she has spoken with are resigned to the likelihood that there won't be an inquiry so long as Prime Minister Stephen Harper's Conservatives are in power. Bennett says that means the only way to get one is through an election and a change of government. Whether or not a national inquiry is called, many participants came to find support from others who shared their experiences. "I decided to come here because I'm not prepared for nothing. I came here to learn and be able to help... and to heal," said Miriam Saunders, the mother of Loretta Saunders, a Halifax university student who was murdered last year. As the roundtable was going on, a parallel meeting was held at Carleton University where attendees listened to families tell their stories. Prime Minister Stephen Harper has rejected calls for a national inquiry into the nearly 1,200 aboriginal women who have been murdered or gone missing in the last 30 years. Ontario Premier Kathleen Wynne wished Harper could have attended today's meeting, but is pleased he sent Valcourt and Leitch. Northwest Territories Premier Bob McLeod, Greg Selinger of Manitoba and Yukon's Darrell Pasloski were also at the meeting, which focused on prevention and awareness, community safety, policing and justice responses. A coalition that includes Amnesty International released a study Thursday saying the federal government ignored 700 recommendations from many studies on how to reduce the number of missing and murdered aboriginal women. Indigenous women make up 4.3 per cent of Canada's population, but account for 16 per cent of female homicides and 11.3 per cent of missing women. Christa Big Canoe, with Aboriginal Legal Services of Toronto, says Ottawa's failure to take the issue seriously is extremely painful for those families that have lost loved ones and are still looking for answers. "We have to start by setting terms of reference that have meaning, that are going to actually result in change, that are actually going to result in improvements and progress," said Big Canoe. "Otherwise, we're just sitting around a table, talking."